Smartphone Apps - How do you protect one? Smartphones have changed the way we interact with the world around us and for nearly every task you do there is an app that will enhance your ability or enjoyment of that task. Many are free but some are paid for and if you are an app creator it is important to protect your work so that you alone are rewarded for the time and effort you have put into creating it. Computer programs are usually protected by copyright as ‘literary works’. Copyright protection is automatic and does not cost you anything. This provides you with the recognition for the way that a computer’s code is written. However, copyright does not protect the computer program’s functionality, the format of its files or any technical effect. Some apps may be protected by a granted patent but they must satisfy specific patentability criteria. The invention should be new, have an inventive step and be capable of industrial application. There needs to be a “technical effect”. The process of acquiring a patent can be complex, expensive and lengthy and the definition of a technical effect for software patents is not straightforward so it is always best to seek professional advice to see if a patent is right for your business. A patent may not always be the right protection, there may be other types that are more suitable. Applying for a registered trade mark protects your branding and applying for a registered design protects the three dimensional shape of your product although this is unlikely to be the case for an app unless you use a specific device with it. Let's get a quick overview of the Internet of Things. Develop an IP Strategy – this does not need to be complicated and can simply be a list of bullet points defining what your goals are for the short and long term. Having a strategy will allow you to communicate it effectively to your workforce and build it into your business plan and technology roadmaps. Use the services of an IP specialist or attorney to help identify any legal aspects that vary from country to country when protecting your IP abroad. Be aware of key dates for renewal of IP rights such as patents and trademarks. Also be aware of key dates for filing abroad, there is a 12 month window for patent filings outside your original country in order to keep your earliest priority date. Regularly review your inventions and explore the scope for combining new technology and generating new IP to avoid being blocked in the future. Consider taking out IP insurance – this can provide valuable cover for defending or asserting your IP rights. If it has been a while since you last searched for patents using Google you are in for a treat. The most recent Google patents has been updated this year to provide some useful new features for searchers. The latest search page is patents.google.com and it is now integrated with Google Scholar so that you can get both patent and non-patent literature appearing in searches. This is very useful for finding relevant prior art. I like Google Patents for a broad overview of results in a particular field; it is useful to quickly get an idea of the number of patents involved and for a quick assessment of the classifications used. Google is continually adding to its database, it already has all the US patents and applications, has added the Canadian, European, WIPO, German and Chinese databases, these latter being also translated. Google warns that they cannot guarantee complete coverage and sometimes take a while to add the most recent applications and grants. Type in a search term and see what pops up. Remember to use quotes if you want an exact phrase. Use the search fields on the left to refine your search. You can sort the results by relevancy or date and can group them by classification. Click on a document to view it and you will see a very useful summary box with information about the patent. There are links to find prior art, look at the citations, view similar documents, see legal status and many other fields, the amount of information does vary from country to country. IP Scope takes this opportunity to wish all readers a Happy Christmas and offer best wishes for a properous New Year. 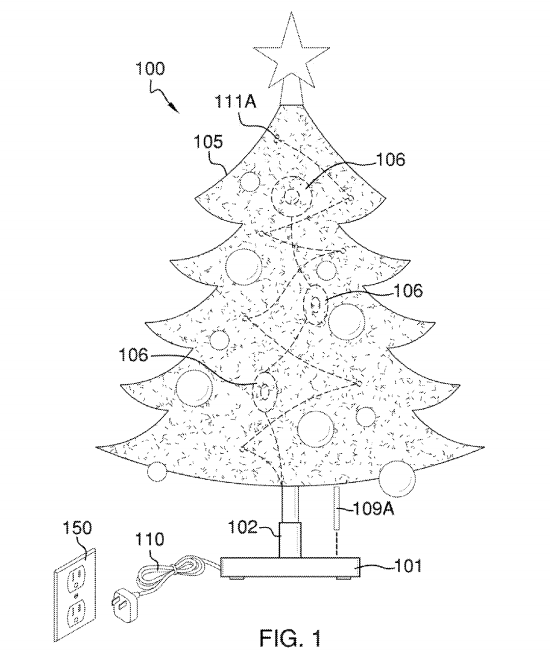 I leave the following for your amusement: a US patent granted on 30 Sept 2014 for a rotating christmas tree with built in MP3 dock and USB port that enables audio to be played from speakers arranged in the tree. I think the patent office may well have been in a jovial mood when this was granted but the legal process does seem to have been followed appropriately. Is it obvious? Well, with hindsight, yes it is, however, the fact that noone had previously described or built such a device has given the benefit of the doubt. 1. A Christmas tree comprising: a Christmas tree; and a stand said stand having a rotating means that said Christmas tree is affixed thereto; wherein the rotating means and said Christmas tree are rotatable with respect to the remainder of the stand; wherein the stand includes docks for playing audio on at least one speaker located on the Christmas tree; wherein a computing means located within the stand is wiredly connected between the docks and the speakers; wherein the rotating means includes a gearing system in mechanical connection between the rotating means and a motor; wherein the motor is in wired communication with the computing means; and wherein the rotational speed of the motor can be adjusted, which in turn controls an output speed of the rotating means. Clearly identify the IP assets that you have – use the UK patent office IP Healthcheck to help with this. You will be surprised, you may have more IP than you think. File patents, designs or trademarks in good time before you go public with them. Prior to going public make sure you have non-disclosure agreements with those people/companies you do need to talk to. Understand your competitors IP – (e.g. be aware of what patents are owned by others who operate in a similar technology space to your own) so that you do not infringe or so that you can negotiate licences if it becomes necessary. Be alert for others who might be using trademarks, logos, designs or technology which you have a legal right to use. A gentle reminder may be sufficient to stop them but be prepared to take legal action. Keep a close watch on your IP portfolio so that you know what needs renewing, but avoid the trap of automatic renewal (it normally gets more expensive each time) and re-assess the value of the IP to you. Consider whether licensing or selling might be a better alternative. Understanding Patents - Part 4: How to read a patent. Patent documents can seem very daunting if you are not familiar with them. They can appear overly complex because of the use of phrases that have been developed by patent attorneys to describe a device or process in terms which are chosen to be unambiguous and stand up to a legal scrutiny. Because patents are legal documents they are actually very logical in their construction. There are clearly defined sections and you can always tell when someone is familiar with patents because they will look immediately at the claims section. The claims (which appear at the end of the main description) are the set of defining statements which begin with the broadest definition of the invention and through additional sub-claims or further independent claims continue to define the invention in increasing detail. The additional claims usually narrow the specification down to the materials and preferred levels of the component parts of the invention. In a well written patent you will be able to start with the claims and then use the detailed description to put “the flesh on the bones” and understand how to reproduce the device or process being described. You can see that such information is very useful as a way to find out how a competitor’s product is made and how they might have achieved any advantages that they claim. For the patent owners it gives a clear indication of what has been done and provides them with the right to prevent anyone else achieving the product advantage in the same way. There has been a lot of attention in the media to patent disputes and there is no doubt that recent news items on Apple and Google have raised the public awareness of the impact that patents can have on the success of a business. One side effect I have noticed is that IP training requests have increased as companies seek to better understand the use of IP in all its forms. I used to provide in-house patent training when working at Kodak and it has been good to once again provide general IP training for companies around Cambridge. I have developed some simple overviews of patents, trademarks, designs and copyright and can tailor courses to meet individual needs. There has also been a growth in the number of online patent search engines and it has become quite difficult to know which is the best system to use for acquiring a knowledge of patents filed by competitors. Patent searching is still a key part of my day to day activities and I have tried most of the available patent search systems. I can therefore provide a good summary of the advantages and disadvantages of many of these systems and suggest ways you can keep on top of the patents emerging in your technical field. Let me know if I can be of any help to you by running a short tutorial or Q&A session on any of these topics. The increased public awareness of corporations buying and selling patent portfolios and generally engaging in patent litigation has sparked a number of questions around patent value such as how you can determine the value of a portfolio? These are good questions and understanding patent value will help you use patents wisely and effectively. The subject is actually quite complex (just google “patent value”) but I will offer a few thoughts on the subject. Of all the patents filed only a fraction have any real value (the EPO recently estimated that 5% of EP patents accounted for 80% of the value), this is true of many portfolios too. The reason is that older patents often become obsolete as new technology emerges and some patents are filed without due diligence on the prior art. Despite improvements in patent searches and access to databases there are still too many patents granted that are subsequently found to be invalid. Understanding the value of a patent requires knowledge of the business sector as well as the technology itself. Does the patent address a real customer need? The broadness and validity of the patent claims will determine how well the patent can hold up against competitors blocking tactics or alternative approaches. Be wary of any fancy software that claims to calculate patent values, they will be fraught with uncertainties and generally require user inputs relating to markets, finance and strategy on top of the technology and validity issues. If it is possible to speak to the business owners of the patents this can provide the best guide to their value. If they are not prepared to talk then you can use metrics such as the size of the patent family, number of times the patents are cited by others and how widely the international filings have been spread. All these are indicators of patent value but there is no substitute for reading and understanding the patent to evaluate it in terms of its future business and strategic value in the marketplace. The 'Intellectual Property Awareness Survey of Business' has shown that only 15 percent of small companies have ever sought advice on safeguarding their ideas. Only 11 percent of firms overall assign responsibility for managing intellectual property (IP) rights. This is compared to 43 per cent of larger companies, meaning that smaller enterprises risk missing out on valuable income from their creativity. IP Scope provides a much needed service to support IP decisions, for example: whether it is cost effective to even begin a patenting process; valuable insights into prior art and competitors’ activities relative to your own ideas; strategic considerations taken in conjunction with your organisation’s business and technical roadmaps (which, of course, you should also have in place!). I have found it has been useful to use the CamJelly co-working space (usually Friday afternoons at the Hauser Forum, Cambridge) and this provides a good place to come in contact with start-ups, many of them already using the IdeaSpace facility. Give me a call if I you want to explore any ways I can help with your own IP needs and I hope you enjoy the rest of this newsletter. Prior art is the expression used to describe any published material that describes your invention and pre-dates your own disclosure of the invention in your patent filing. It often comes in the form of an earlier patent but with the huge amount of data on the internet, it can equally well come from a journal article, a blog or press release, etc. Many inventors feel that they do not need to do a prior art search and feel that it is not money well spent especially when the patent office is going to do their own search to find out if the invention is novel. Secondly, the search you get from the patent office will take several months and if there is prior art, all you get will be a listing of just enough of the prior art to satisfy the examiner that the invention is not novel or lacking an inventive step. It will still leave you without a full knowledge of all the potential prior art and if you want to re-draft your application you will almost certainly need to do another search to fully understand the patent landscape. Understanding this patent landscape early in the process will actually help you to develop your invention and may even help define your final design so that it is clearly differentiated from the prior art. IP Scope is now in its second year... Thanks to all the support of family, friends and clients I have been able to start and maintain a new business in the midst of a recession. Experts tell me that if I have survived this far then there is a very good chance of continuing well into the future. Let’s hope they are correct! I have had some fascinating projects to work on during my first year from quite a wide range of topics, including imaging, materials science and of course the printed electronics arena which is of particularly interest to me. The latter has been an area where I have acted as an associate consultant for Cambridge Intellectual Property Ltd. to expand their business and over the course of the year I have given two webinars on the subject of using patent data to provide intelligence on a company’s technical and strategic direction. Examples were given from a case study of the Plastic Logic patent portfolio. I’ve experimented with social media and quite like the use of twitter as a business tool for gathering current information on many topics. I use it myself and have an IPScope twitter account for sharing information on recent patents, new technologies and new products or inventions. Do contact me if I you want to explore any ways I can help with your IP needs and I hope you enjoy the rest of this newsletter. There are several questions that repeatedly pop up when people are asking me about the patenting process and advantages of having a patent portfolio. In this article I will address the question of what rights a granted patent gives to the owner (the assignee). The most common misconception is that a patent gives the owner a right to practice his/her invention. In fact, it is not uncommon for an inventor to be granted a patent and not have the right to practice the invention. The patent merely grants the right to stop or exclude others from practicing the invention. At the same time, the patented invention may have subject matter that falls within the exclusive rights of someone else’s broader patent. In such an instance, the broader patent is said to dominate. Such a situation commonly occurs when the second patented invention represents an improved version of an earlier issued, more basic patent. The owner of the earlier dominating patent may be free to practice the basic invention (but may not be free to practice the improved version of the second patent). The owner of the second patent may not be free to practice either invention without permission of the owner of the first patent. These situations are quite common and can lead to the development of patent license agreements between companies such that both companies are able to use each other’s inventions and mutually benefit. I thought it was time to provide some news of my first 6 months in business since leaving Kodak European Research. The time has flown by; learning how to set up a business together with all the associated aspects of networking, creating websites, setting up client databases etc. has been a great experience and great fun! The transition from working under the umbrella of a large corporation to going it alone has been a steep learning curve but, thankfully, I can say that I have replaced all the in-house patent searching and analysis tools with equally useful, lower cost alternatives that allow me to continue to provide the same quality service. It is my pleasure to be able to offer these plus a range of patent and strategic IP training modules to a much wider group in the imaging, materials science and printed electronics sectors. In this first post I talk about one of the key issues I find in many discussions with new or small business enterprises and introduce you to “Phil’s Patent Picks”. One of the more frequently asked questions I get is “Is my idea worth patenting?” You can only answer this question correctly when you really understand your technology space. Firstly you need to know if your idea is patentable; is it novel, inventive (non-obvious) and useful in some way? Most of this can be understood by reference to published patents or patent applications and scientific literature. Then you need to assess whether there is a market for the product, process or improvement you have invented. This combination of technical and business intelligence is most valuable in defining your strategy and being able to answer the original question. Gathering this information is vital and often is a pre-requisite for any discussions with partners or sponsors with whom you want to do business or try to obtain funding from. However, it is often neglected because the costs of doing this are thought to be prohibitive. 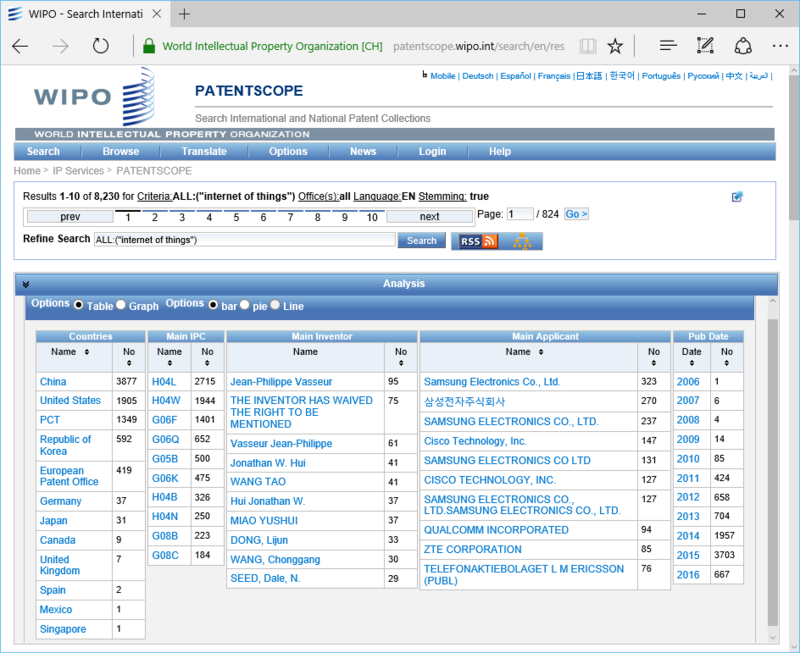 IP SCOPE believes strongly that such information should not be expensive to find given that most of it is readily available through publicly accessible patent databases. We can provide training to help you discover this information for yourself or better still do it for you and free up time for your other business needs. 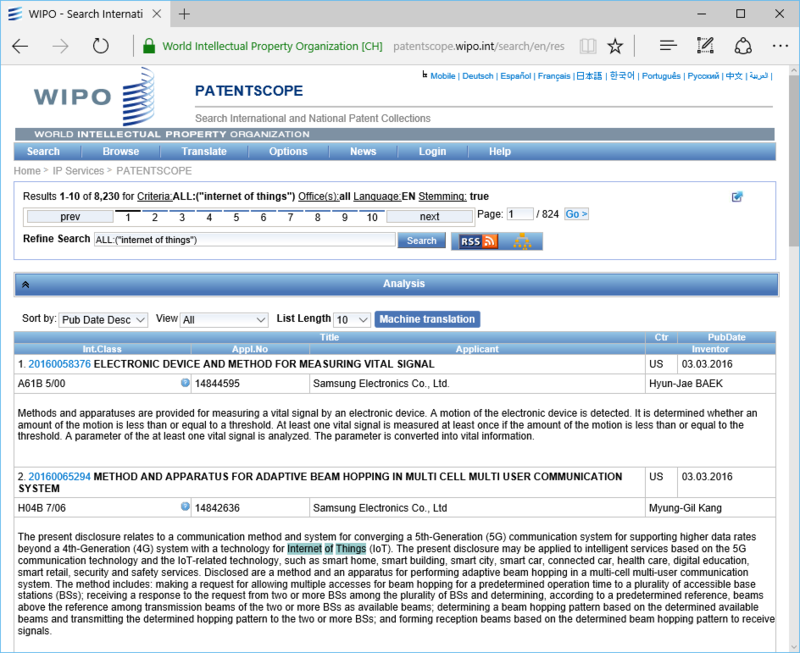 A simple patent search can start from around £500 to provide a basic “scoping” search of a technology space which will provide a database of relevant patent documents for subsequent analysis and enable further searches or analyses to be conducted in a targeted manner. I am primarily a research scientist and so I love to delve into the technology behind inventions. In the field of printed electronics there are plenty of examples of disruptive technology patents and I have started a new blog which provides some technical background for a few of the more interesting patents I come across in my work. Have a look at it here.